With the price increase of Fuji and Kodak we also got new film stock here in Tokyo. Yodobashi Camera now has a bunch of Rollei B/W films and CineStill films on the shelves. ... and I couldn't resist. Got myself a roll of CineStill 800T and 50D at the ridiculous price of 1800 yen a roll! My friend just shot a roll of 800T, pushing it one or two stops. People say this film is designed for pushing and the latitude is huge etc. That may very well be the case if you develop the film in the chemistry it was designed for. Not C-41. My friend had me scan the film for him and I gave it a try on the Frontier and the CoolScan. Either way you do it, it just doesn't look right. I've never seen uglier and bigger grain in color negative film. Shooting Natura 1600 pushed to 3200 results in better pictures than this stuff. The tungsten white balance combined with the wrong chemistry makes for horrible colors as well. Given the not so nice results I've seen already I decided to shoot my roll with an 85B color filter and exposed at 500ISO as recommended on the packaging. Apparently an 85B filter undoes the Tungsten white balance and let's you shoot in daylight. My results all looked greenish and needed magenta added to make them look semi-normal in color. Again, I'm not sure this was a problem with the filter I used or the C-41 chemistry. When developed in proper motion picture chemistry this film always looks awesome. At least in the movies that I watch... 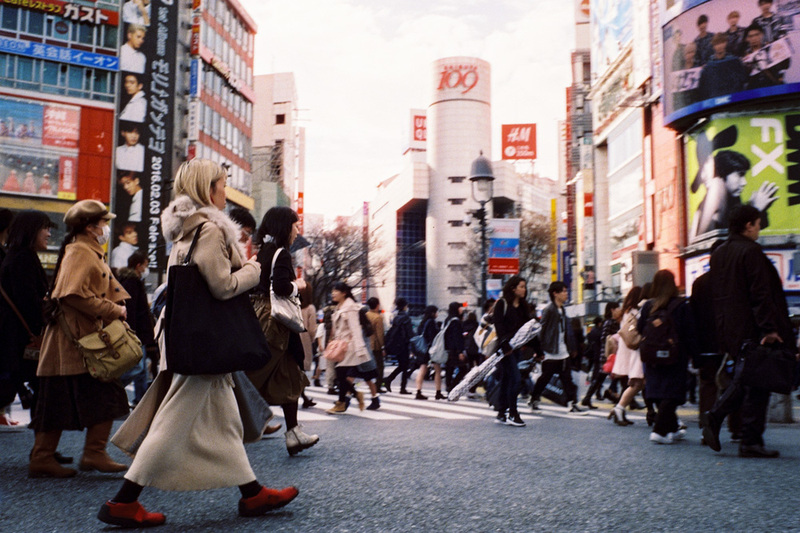 This roll was developed at Bic Camera in Shibuya, using a Frontier mini lab. I never have issues with these guys. They maintain their chemicals properly, and the Frontier pretty much guarantees consistent temperature during developing. But this stuff almost reminds me of when I tried developing C-41 at home. These pictures just look like improperly processed film. Somehow they all had a greenish tint. The next issue I found was the halation effect you get when shooting anything that is really bright. I've heard of this before but didn't quite expect the effect to be this strong. Apparently this is due to the remjet being removed so these rolls are safe to be processed in C-41 labs. Look at how her feet and the sign glow. Looks to me like the remjet layer is there for a very good reason! Look at the apron and bag. I don't know. some people may like these weird effects. To me these just look like mistakes. The remjet removal causes the glowing effect and the wrong developer results in improper colors to my eye. I will shoot through the CineStill 50D roll just to use it up, but will not get any more of this film. Certainly a great effort by the guys running CineStill, but it's not for me. Know what you can get out of Ektar or Portra films I just don't see a reason to hack motion picture film to work in my still camera.